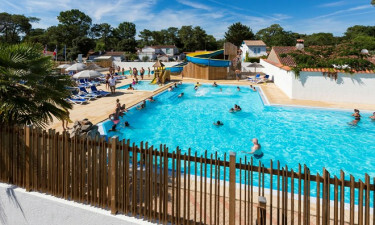 Les Dunes is situated in sunny Bretignolles-sur-Mer, Vendée, a mere 100 metres from the sea and access to the beach. This luxury camping site is set in a pine forest and comes with an aquatic park and a fully-equipped playground and sports fields. Your mobile home booked through LuxCamp gives you all the comforts of home while retaining the rustic tranquility of the wooded setting. With the wide range of activities available, all members of the family are assured a memorable camping holiday. 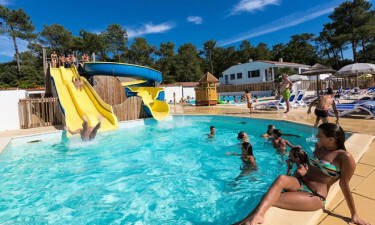 Luxury camping at Les Dunes begins with making sure the kids are thoroughly entertained while you work on your tan. Les Dunes’ organized activities at the Kid’s Club, kindergarten, and playgrounds will keep children laughing and learning the whole day. The whole family can join in the fun with aerobics and aqua fitness classes. For aquatic fun, Les Dunes provides a covered pool and a heated outdoor pool with a separate paddling pool. All kids know it’s not a water park without slides, and Les Dunes steps up with different sized water slides for both the indoor and the outdoor pool. A short 600-metre walk from the campsite and through a pine forest brings you to the sandy beach and a host of water sports. Spend a quiet afternoon fishing or try your hand at sailing, canoeing, or yachting. 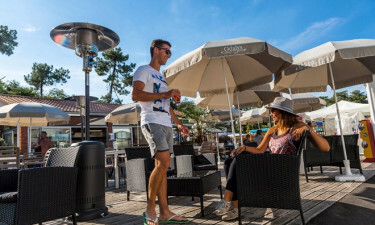 You can’t beat Les Dunes for a luxury family camping holiday.